How will you be found on the world wide web? Let Synergy Networks help you put your business in the eyes of potential customers. Take advantage of a marketing plan that will not only generate website traffic, but will also strive to ensure that the right kind of customer reaches your website. With an eye-catching ad and accurate, focused keywords, Synergy Networks can put your advertising dollars to work for you. Depending on what package you choose, your ad could generate upwards of 20,000 impressions. Our team will generate reports and email them to you, giving you an idea of how effective your ad has been. Step 1: We help you create a brief, professional ad consisting of a title and 2 lines of text. 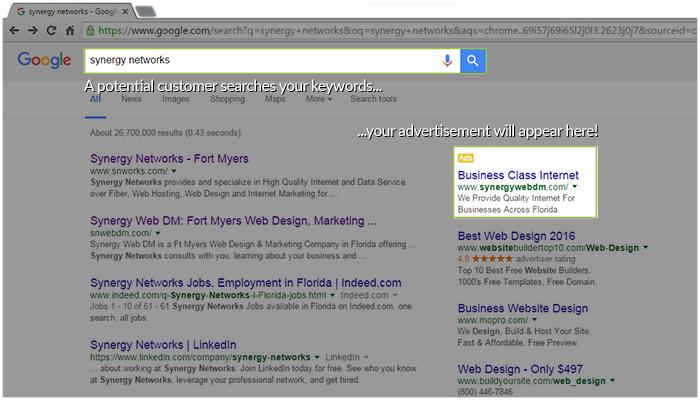 Step 2: Each ad will be assigned an unlimited number of keywords. The more focused and relevant, the more likely your company will receive a click-through from your target customer base. Our team will generate reports and email them to you, giving you an idea of how effective your ad has been. Each month, we can work with you to further develop your ad - changing keywords, refining ad text, removing keywords that are not bringing in the desired type of traffic, and more. I'm looking for a company where I can market my website online. Synergy Web DM can meet all your online marketing needs. The first thing you need to do is either call us at (239)790-7000 or fill out the contact form. The most comprehensive web strategies to maximize the dollars you spend on web marketing. So, call us at (239)790-7000 or fill out the contact form.